This kitchen design packs ample work and storage areas into every available space. The white chocolate finish Medallion kitchen cabinets with a burnt sienna glaze include concealed hinges and slow close doors and drawers. The U-shaped design includes a peninsula with space for seating, and additional cabinets incorporate a built-in television and extra storage. 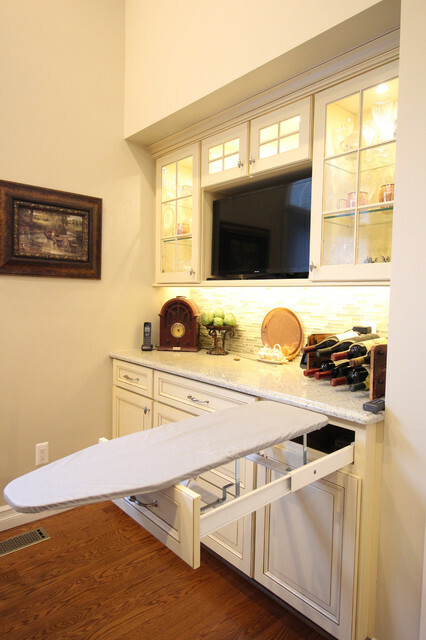 A Rev-a-shelf pull out ironing board is neatly concealed inside the cabinets. The design is complemented by a mosaic tile backsplash, hardwood floors, and Top Knobs hardware. 11. In-built domesticsWill a fold-out ironing board change your life? Probably. It means items can be quickly ironed on the go without going to the trouble of wrangling a freestanding ironing board into position and away again. Pull it out, fix that crinkled collar pronto, then slide the whole shebang back into the drawer – quick, easy, no fuss. And you can store the iron and spray bottles in the cupboard below.Tip: When unfolded, a pull-out ironing board can be anywhere from 800-950 millimetres long, and it should be installed perpendicular to the bench. Ensure there’s enough clearance for it to be used comfortably without blocking the kitchen thoroughfare. And don’t forget to include a power point nearby.